caps Archives · Stop the Cap! Verizon, the country’s leading provider of millimeter wave 5G wireless broadband, is promising to expand service nationwide, but admits it will only service urban areas where the economics of small cell/fiber network infrastructure makes economic sense. At the Mobile World Congress conference in Barcelona, Spain, Verizon’s vice president of technology planning told PC that when it launches its mobile 5G network later this spring, home wireless internet service will come along for the ride. That means Verizon’s millimeter wave 5G network is designed to be shared by everyone and everything, including businesses, residential customers, cell phone users on the go, Internet of Things applications like smart meters and intelligent traffic systems, and more. 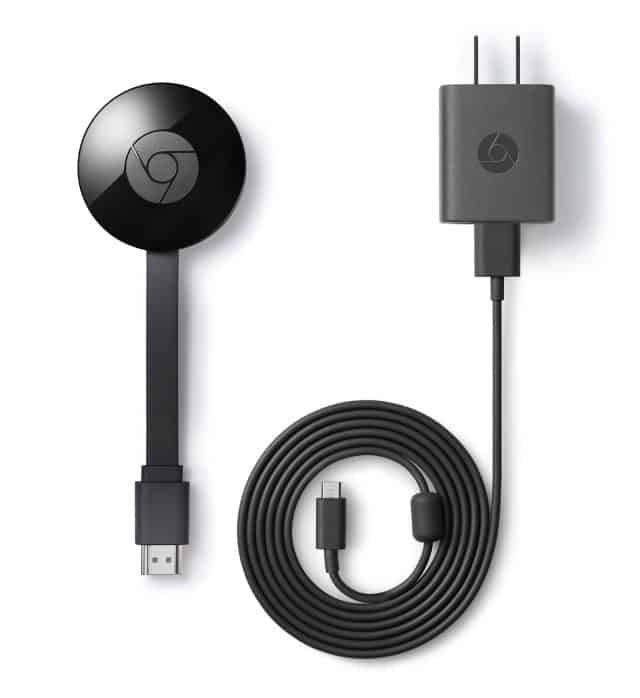 But that network will not be everywhere Verizon or Verizon Wireless currently provides service. “Our deployments of millimeter wave are focused on urban centers. 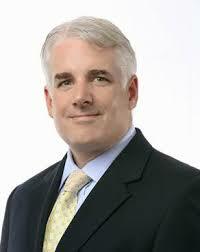 It’s where the people are, where the consumption is,” Koeppe said. Verizon faces significant costs building out its 5G wireless network in areas where it does not already offer FiOS fiber to the home service. Verizon’s 5G network is dependent on a fiber optic-fed network of small cells placed on top of utility and light poles at least every few city blocks. That means Verizon is most likely to get a reasonable return on its investment placing its 5G network in urban downtown areas and high wireless traffic suburban zones, such as around event venues, large shopping centers and entertainment districts. The company has chosen to deploy 5G in some residential areas, but only within large city limits. So far, it has generally steered clear of residential suburbs in favor of older gentrified city neighborhoods with plenty of closely-spaced multi-dwelling apartments, condos, and homes, as well as in urban centers with converted lofts or apartments. Rural areas are definitely off Verizon’s list because the millimeter waves Verizon prefers to use do not travel very far, making it very expensive to deploy the technology to serve a relatively small number of customers. Other carriers are not committing to large scale 5G deployments either. Sprint has plans to introduce its own flavor of 5G, which won’t use millimeter wave frequencies, by June in nine U.S. cities. T-Mobile has talked about deploying 5G on existing large cell towers, which means one tower will serve many more customers than Verizon’s small cells. But with more customers sharing that bandwidth, the effective speed customers will see is likely to be only incrementally better than T-Mobile’s existing 4G LTE network. AT&T is initially moving in the same direction as T-Mobile, meaning many customers will be sharing the same bandwidth. That may explain why AT&T’s current 5G hotspot service plan also comes with a 15 GB data cap. Verizon says its millimeter wave network will, by geography and design, limit the number of people sharing each small cell, making data caps unnecessary for its 5G fixed wireless home broadband replacement, which delivers download speeds of around 300 Mbps on average. “We engineer the network to give the customer what they need when they need it, and the results speak for themselves,” Koeppe said. Verizon is already selling its 5G service in limited areas for $50 a month to Verizon Wireless customers, $70 a month for non-customers. There are no data caps or speed throttles. Based on the plans of all four major U.S. carriers, consumers should only expect scattered rollouts of 5G this year, and only in certain neighborhoods at first. It will take several years to build out the different iterations of 5G technology, with millimeter wave taking the longest to expand because of infrastructure and potential permitting issues. 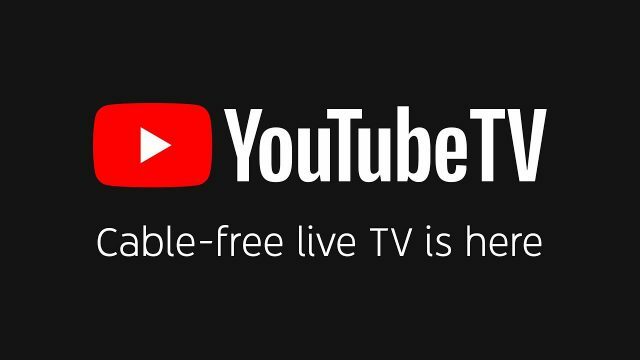 There are stark contrasts in internet subscription rates depending on where you live and how much money you make, according to newly released findings from the U.S. Census Bureau. As the cost of internet access continues to rise, affordability is increasingly a problem for poor Americans. In rural areas, a lack of broadband availability is also holding down subscription rates. Telfair County, Ga. has the dubious distinction of being America’s worst connected county, with just 25% of households signed up for internet access. The most connected communities are found in suburban areas surrounding major cities along the Pacific Coast and northeastern U.S. More than 90% of households also have internet access in suburban areas outside of the District of Columbia, Atlanta, and Denver. Although internet subscription rates are sky-high in wealthier suburban areas, poor inner city neighborhoods score poorly for internet subscriptions. In the Chicago metropolitan area, 77% of Cook County households subscribe to the internet. In downtown Los Angeles, just 80% are signed up. In D.C., only 78% subscribe. In Philadelphia, there were some neighborhoods with just 25% of residents getting internet service. In the Tioga-Nicetown neighborhood, only 37.1% of households had internet service. Persistent poverty, crime, unemployment, and low-income in poorer parts of the inner city have conspired to make it very difficult for residents to afford internet access at prices often over $50 a month. Increasingly, poor urban residents are turning to their smartphones as their sole source of internet. In the Philadelphia neighborhood of Fairhill, where internet subscriptions are below 38%, 12% of homes report smartphones are the only way they connect to the internet. Pew Research Center senior researcher Monica Anderson told The Inquirer that 31 percent of Americans who earn less than $30,000 a year now rely only on smart phones for internet access, a percentage that has doubled since 2013. “We are seeing smartphones help more people get online,” she told the newspaper, adding that data caps and data plan costs lead people to cancel or suspend services. Some of the worst scoring counties where internet subscription rates were lower than average are located in rural areas across the upper Plains, the Southwest and South. The desert states of Arizona and New Mexico, south Texas, the lower Mississippi through Southern Alabama and some areas of the Piedmont of Georgia, the Carolinas and Southern Virginia were notable for containing many counties with low broadband internet subscription rates, although there were exceptions throughout. Only 67% of Native Americans have signed up for internet access, compared with 82 percent for non-Native Americans. Native Americans living on American Indian land had a subscription rate of 53 percent. 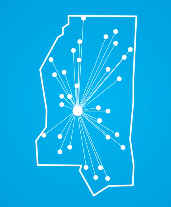 Thirteen percent of the counties achieving better than an 80% subscription rate were located in “mostly rural” or “completely rural” counties, often getting telecommunications services from a local co-op or municipal utility. Assuming a rural customer can buy internet access, the next impediment is often cost. In “mostly urban” counties with median household incomes of $50,000 and over, the average broadband internet subscription rate was roughly 80 percent, while in “completely rural” counties with the similar median incomes, the average broadband internet subscription rate was only 71 percent. 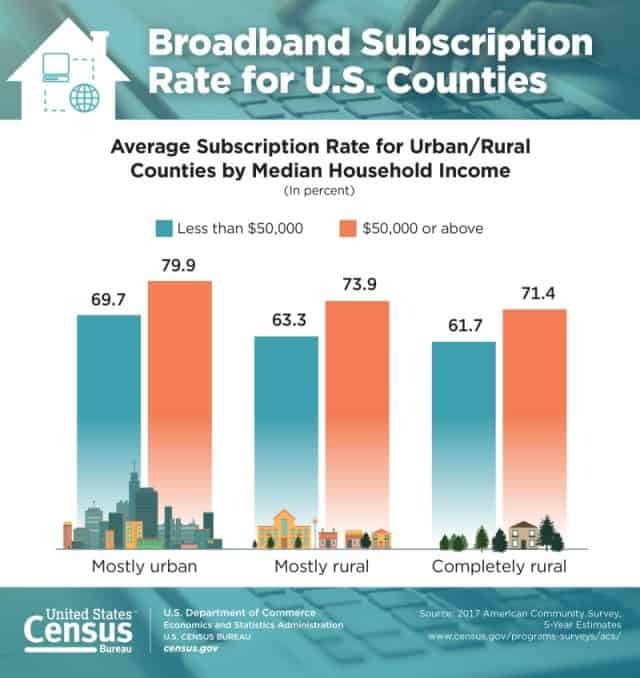 “Mostly urban” counties with median household incomes below $50,000, however, only reported average broadband internet subscription rates of 70 percent while “completely rural” counties with similar median incomes had average broadband internet subscription rates of just 62 percent. This contrast showed up most dramatically in the South. 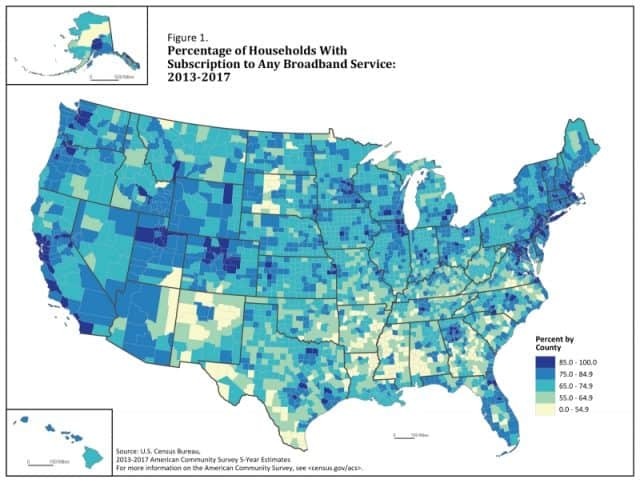 Of the 21 counties with populations of at least 10,000 and broadband internet subscription rates at or above 90 percent, 12 were in the South, four were in the Midwest, four in the West, and one in the Northeast. Conversely, of the 24 counties with broadband internet subscription rates at or below 45 percent and populations of at least 10,000, 21 were in the South, two were in the West, and one was in the Midwest. 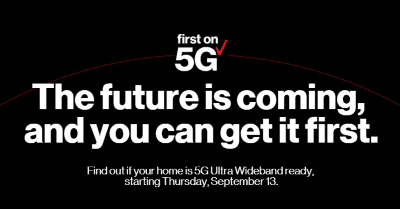 Verizon 5G Home will begin accepting new customer orders for its in-home wireless broadband replacement as of this Thursday, Sept. 13, with a scheduled service launch date of Oct. 1. The new high-speed wireless service will be available in select parts of Houston, Indianapolis, Los Angeles, and Sacramento. Verizon CEO Hans Vestberg is calling the service part of Verizon’s 5G Ultra Wideband network. Initial reports indicate speed will range between 300-1,000 Mbps and existing Verizon Wireless customers will get a $20 price break on service — $50 a month instead of $70 for non-Verizon Wireless customers. We are still waiting word on any data caps or speed throttle information. Verizon informs Stop the Cap! there are no data caps or speed throttles. Service is effectively unlimited, unless hidden terms and conditions introduce unpublished limits. 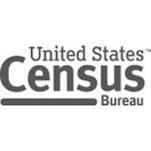 Interested customers can determine their eligibility starting at 8 a.m. ET on Thursday from the Firston5G website. If you are not eligible initially, you can add your email address to be notified when service is available in your area. Customers in the first four launch cities will be using equipment built around a draft standard of 5G, as the final release version is still forthcoming. Verizon is holding off on additional expansion of 5G services until the final 5G standard is released, and promises early adopters will receive upgraded technology when that happens. Verizon is clearly providing a greater-than-average number of enticements for early adopters, undoubtedly to placate them if and when service anomalies and disruptions occur. Although Verizon has done limited beta testing of its 5G service, it is very likely the 5G network will get its first real shakeout with paying customers. 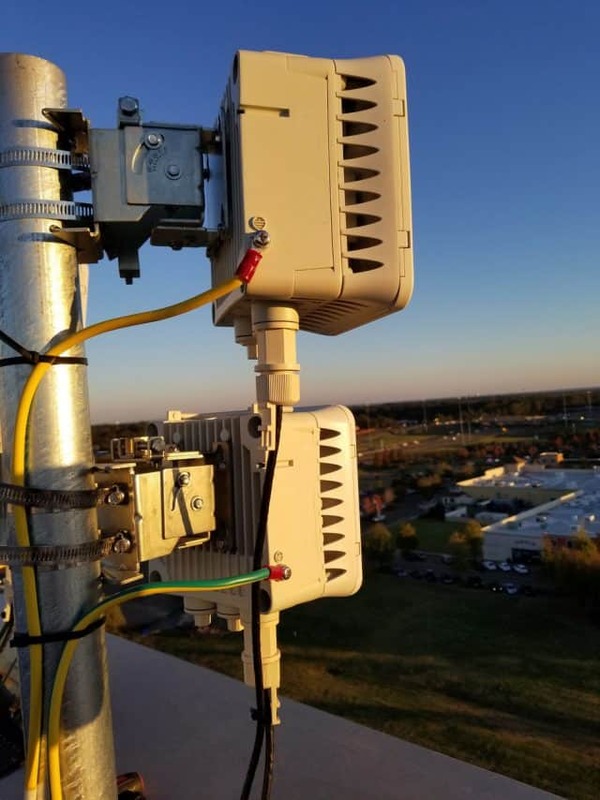 Unanticipated challenges are likely to range from coverage and speed issues, unexpected interference, network traffic loading, the robustness of Verizon’s small cell network, and how well outside reception equipment will perform in different weather conditions, particularly heavy rain and snow. With a large number of freebies, and no charges for 90 days, customers are likely to be more forgiving of problems, at least initially. Verizon’s 5G network depends on millimeter wave spectrum, which means it will be capable of providing very high-speed service with greater network capacity than traditional 4G LTE wireless networks. But Verizon will have to bring 5G antennas much closer to subscribers’ homes, because millimeter wave frequencies do not travel very far. Verizon will combine a fiber backhaul network with small cell antennas placed on top of utility and light poles to reach customers. That explains why Verizon’s initial 5G deployment is unlikely to cover every customer inside city limits. There are substantial deployment costs and installation issues relating to small cells and the optical fiber network required to connect each small cell. Verizon’s existing FiOS network areas will offer an easier path to introduce service, but where Verizon does not offer its fiber to the home service, it will need to bring fiber optic cables deep into neighborhoods. AT&T sees a similar challenge to 5G and is openly questioning how useful wireless 5G can be for urban/suburban broadband service, considering it can simply extend fiber optic service to those homes and businesses instead, without a costly 5G small cell deployment. Article updated at 6:28pm ET with information about data caps and speed throttles provided by Verizon.